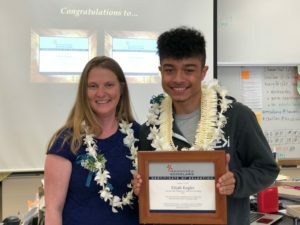 February 16, 2018: After traveling to the islands of Hawai‘i and Maui to award a total of 11 students and their eight stellar proposals with highly coveted telescope time, we visited the island of O‘ahu to continue our Maunakea Scholars awards season, beginning with a trip to Kapolei High School. Executive Director of the Canada-France-Hawai‘i Telescope (CFHT), Doug Simons, and Mary Beth Laychak, program lead for Maunakea Scholars and outreach program manager at CFHT, along with leadership from the Hawai‘i Department of Education joined educators, students, and families of Kapolei High School to present three promising students with telescope time on Maunakea summit. Kapolei students enjoyed the great fortune of being mentored by two graduate students from the University of Hawai‘i Institute for Astronomy, Maissa Salama and Travis Berger, who brought a wealth of research and experience to the table. Working closely with students over a number of months, Salama and Berger helped the students explore their questions about the universe and evolve curious ideas into brilliant, well-informed proposals. We trust these aspiring astronomers will make the most of their telescope time and are confident authentic, hands-on experience will stimulate their incredible potential and set them on a path to a vibrant future in STEM fields. We believe investing in the youth of Hawai‘i will raise the next generation of world-class scientists, engineers, and astronomers that will make great contributions to Hawai‘i, the scientific community, and the world.